His Eminence Archbishop Juvenaly (Kilin) of Izhevsk was a bishop of the Russian Orthodox Church Outside of Russia and of the Church of Russia during the 1930s to 1950s. An emigre to China, he returned to the Soviet Union after World War II. Ivan Kelsievich Kilin was born in April 1875 of religious parents in Vyatsk gubernya. While his parents were of a peasant background, his father was a member of the Sarapulsk Zemsky Administration for many years. Ivan's love for the Orthodox Church was inspired by his pious mother who often related her childhood experiences of pilgrimages to many monasteries and holy places in Russia with her mother. After completing his education in the local school in Arzamastsev, Ivan entered the Sarapulsk Uezd School, graduating in 1889. At the school Ivan was much influenced by his first elder-mentor Bishop Afanasy of Sarapulsk, who later was Archbishop of Ekaterinburg. After the death of his father in 1894, Ivan undertook a pilgrimage to the Monastery of Verkhotursk. While venerating the relics of St. Simeon at the monastery, Ivan was overtaken with the desire to become a monk. With the blessing of his mother, Ivan entered the St. Nicholas Missionary Monastery at Belogorsk. At the monastery, the novice Ivan became the cell-attendant of the Superior, Archimandrite Varlaam. He became active in construction projects of the monastery, building residences and churches for the monastery, including helping complete the construction of the monastery cathedral on Belaya mountain. He was tonsured a monk with the name Juvenaly on July 2, 1900. Three weeks later he was ordained a deacon by Bishop Peter of Perm. On February 12, 1902, Bishop John of Perm, Bp. Peter's successor, ordained Dn. Juvenaly a priest. During the following years, Fr. Juvenaly accompanied Fr. Varlaam on visits to holy sites in the Holy Land, Mount Athos, and many monasteries in Russia, including Kievo-Pecherskaya and Holy Trinity-St. Sergius Lavras and New Athos, Valaam, Optina, and Sarov monasteries. With the blessing of Bp. John of Perm, Fr. Juvenaly was tasked by Archim. Varlaam to establish a branch (podvorie) of St. Nicholas monastery in Perm of which he was appointed the leader. Among the structures he built was the Church of St. John Chrysostom. In 1910, Fr. Juvenaly was transferred as the economus to the Episcopal House in Perm where he met the missionary from Kamchatka, Hieromonk Nestor (Anisimov) who inspired in him a desire for distant missionary work. In February 1912, Fr. 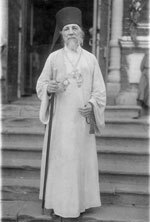 Juvenaly was elected by the Holy Synod as the first hegumen of the Tabor Transfiguration of the Savior Hermitage where he became known as a zealous builder of churches, notably the Transfiguration of the Savior Cathedral in 1912 and, in 1915, the house church of the Mother of God of Kazan and the Elevation of the Cross Church. On July 19, 1912, on the feast day of St. Seraphim of Sarov, Bp. Pallady raised him to the dignity of hegumen in the Annunciation Church of the Synodal podvorie. In 1915, he was appointed dean of all monasteries of the Diocese of Perm by Abp. Andronik of Perm. In June 1913, he was raised to the rank of archimandrite. In 1919, Archim. Juvenaly moved first to Chita in Siberia, and then on to Harbin in Manchuria in 1920. After arriving in Harbin, Fr. Juvenlay was appointed rector in the Church of the Dormition and supervisor of a new Russian cemetery. In 1922, he established a monastery for men on Krestovsky Island with the blessing of Abp. Methodius of Harbin, but before the year was out Fr. Juvenaly was transferred to be the superior of an Orthodox monastery in Serbia. In 1924, he returned to Harbin and was appointed to establish an new monastery dedicated to the Kazan Mother of God. As the center piece of the monastery he had built the cathedral with three altars in honor of the Kazan Icon of the Mother of God, in which the right altar was dedicated to the Great Martyr Panteleimon and left altar to the Archangel Michael. The monastery also included cells for the monastics, a print shop, and a hospital. The foundation of the cathedral was laid and blessed by Abp. Methodius on August 17, 1924 and consecrated in December of the same year. In late 1929, Archim. Juvenaly was awarded the rights of a superior of a first-class monastery by the Holy Synod of ROCOR. In 1934, the Holy Synod, through the intercession of Bp. Victor, head of the Russian mission in Peking, decreed Archim. Juvenaly to be Bishop of Xinjiang (in Eastern Turkestan) as the second vicar of the Russian mission, with his residence in the city of Urumchi to serve expatriate Russians from the Bolsheviks. After a formal election, Archim. Juvenaly's consecration took place on February 10, 1935 in St. Nicholas Cathedral in Harbin by the celebrants Abps. Meletius of Harbin and Manchuria and Nestor of Kamchatka and Petropavlovsk, Bps. Dimitry of Hailar and John (Maximovich) of Shanghai, who was the first vicar of the Peking Mission. After his consecration, Bp. Juvenaly found travel to his new see impossible. As a consequence, Bp. Juvenaly continue as superior of the Kazan Mother of God Monastery until in 1936 when he administered the Peking mission for Bp. Victor while he was in Belgrade. During 1937-1938, Bp. Juvenaly acted for vicar bishop John of Shanghai while he worked for the Synod of Bishops in Sremski Karlovci. After Bp. John's return, Bp. Juvenaly was attached to St. Nicholas Memorial Church in Shanghai participating in the work of the mission. In 1940, the Synod of Bishops of ROCOR returned Bp. Juvenaly as superior of the Kazan Mother of God Monastery and the monastic community in Trekhrechiye in Harbin with the title of Bishop of Qiqihar, second vicar of the Diocese of Harbin and Manchuria. In 1944, Bp. Juvenaly was awarded the right to wear a cross on his klobuk. The end of World War II and the occupation of Manchuria by Soviet forces again changed Bp. Juvenaly's life. In 1947, he was forced back to the Soviet Union and came under the administration of the Moscow Patriarchate which was appointed him Bishop of Chelyabinsk. In 1948, he was elevated to the rank of archbishop and appointed to lead the Diocese of Irkutsk. In 1949, he was transferred as the first bishop of the newly reestablished Omsk cathedra. In Omsk, he translated the relics of Metropolitan John of Tobolsk to a new crypt. In 1952, Abp. Juvenaly was transferred again, this time to the see of Izhevsk and Udmurtsk. In time as Archbishop of Izhevsk and Udmurtsk, Abp. Juvenaly began to feel his health declining. He asked to retire, but the patriarch asked him to remain, even offered him the rank of metropolitan, an offer that Abp. Juvenaly declined, stating he does not serve to gain rank. Foreseeing his death, Abp. Juvenaly asked Archim. Peter (Semyonovykh) from Holy Trinity-St. Sergius Lavra to tonsure him into the great schema. Archim. Peter, who knew archbishop from Harbin, did so with the name John. He laid in his schema robes thereafter. Abp. Juvenaly fell ill late in 1958. On December 25 he was given the Sacrament of Unction. On December 27, he donned his schema robes. On December 28, 1958, Abp. Juvenaly reposed saying "Here is our new land, here is our new world" after having asked his friends in attendance to sing the Prokeimenon "Sing to our God, sing, sing to our King, sing" three time. The Diocese of Izhevsk is preparing for the glorification of Archbishop Juvenaly as a local saint. This page was last edited on March 11, 2012, at 21:07. This page has been accessed 9,025 times.